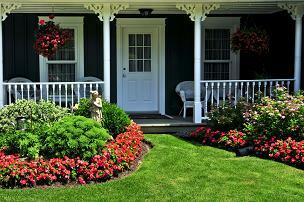 The soil underneath your home can have a huge impact on your home and health. Learn the warning signs, and how to fix and prevent the problems. When choosing land for your new modular home, you’re probably taking multiple things into consideration. Distance from your work, the feel of the neighborhood, and what school district you want your children to be in may all be concerns of yours, but equally if not more important than the location of your home, is the makeup of the ground that your home will be sitting on. Wait for what comes next and you tell me if your soil is something you want to leave to chance. The presence of toxic chemicals or dangerous waste products are the most obvious and potentially harmful issue, and unfortunately is often given the least amount of thought. People tend to think that if they live in a rural or suburban area, that there is no need to test the soil for contaminants. The truth is that if you live near a river, near a flood plain, next to mountains or hills, or near even small factories, testing your soil is a necessity. 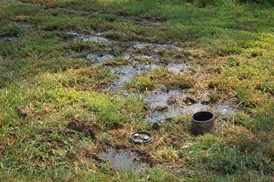 Soil contamination can also occur when there is an underground propane tank, old or dilapidated buildings, or a damaged or improper septic system nearby. Your body absorbs harmful chemicals in four major ways, through contact with the skin, inhalation of particles, the drinking of contaminated ground water, or through direct ingestion. 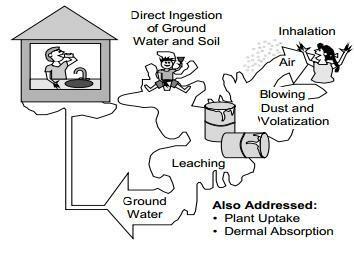 Young children are especially susceptible to exposure through direct ingestion which is by far the most harmful. The health issues that may occur vary widely depending on what the specific contaminant is, but the results of exposure can be terrible. Some of the most common (and horrifying) symptoms include stomach lesions, fetal malformations, increased blood pressure, neurotoxicity, convulsions, extreme weight loss, liver toxicity, and kidney failure. There are three different main types of soil: silt, sand, and clay. 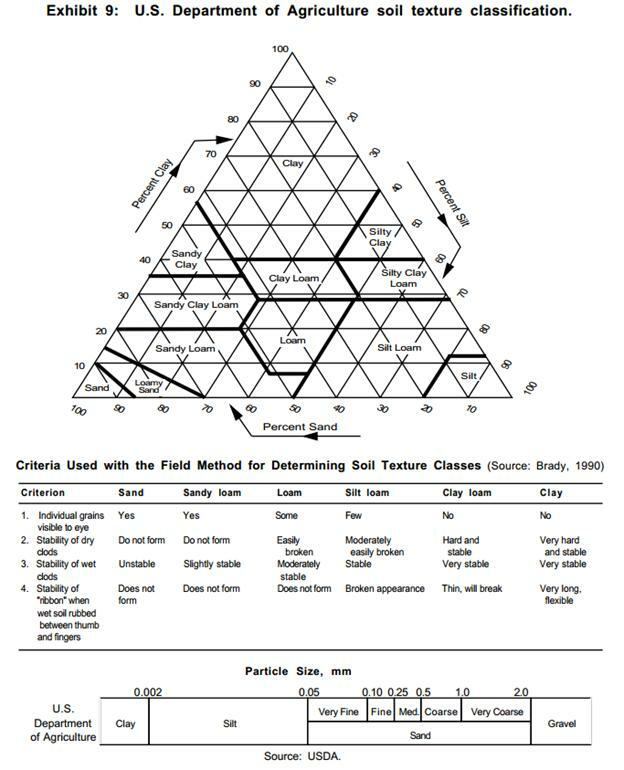 Click here to see a graph for a more detailed look at the types of soil you might find. As you can see from the image above, clay has the smallest particles, followed by silt and then sand. A smaller particle size means that the soil will expand more when it gets wet. This means that clay will expand the most when it comes in contact with water, silt will expand a small amount, and sand will expand hardly at all. The type of soil that your home is built on can have a huge impact on how much your home will settle in the years after it is built. As soil absorbs water and then gets dried out, it grows and shrinks in size. Since it’s got nowhere to grow but up, this means that the elevation of different parts of your home can shift by fractions of an inch every day. This might not sound like a big deal, but if the front of your house is being pushed up by expanding soil and the back isn’t, it puts stress on your foundation and can cause cracking of the concrete slab that your home is built on. Every home settles at least a little bit after construction, but if your home was built on unstable or improperly compacted soil, it may settle a great deal – in extreme cases it can settle as much as a foot or more – often at different rates in different parts of the house. While modular homes are less susceptible to damage from differential settlement than site-built homes, even modular homes can have issues. In extreme cases, walls and floors can crack and shift, making the home unsafe to inhabit. The easiest and most important thing to do to prevent differential settlement and the issues that come along with it is to hire a specialist, ideally a soils engineer, to do a survey of the soil under your home. The specialist may recommend a number of things, among them, pre-compacting the soil, proper drainage, and installing support piers under your foundation. In order to prevent a home from settling, a pretty straightforward solution is simply to try to compact the soil as much as possible before the foundation is laid down. 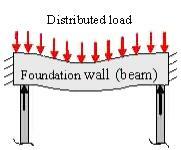 This is especially useful when your land has had to be leveled out by backfilling soil into parts of the build area. The backfilled soil is usually significantly less dense (and therefore much more prone to differential settlement) than the soil that was already there. This is a fairly inexpensive option, but it must be closely supervised by your expert to be effective. While this solution will do very little to prevent the general settlement of your home, it can prevent the constant expansion and compacting that occurs when the soil under your home gets wet. By directing water away from the base of your home, the soil under your foundation will shift far less, causing fewer ongoing maintenance problems. This is generally a fairly inexpensive avenue to pursue because most build sites need to be leveled as part of site prep anyway. Directing your crew to make sure the land is draining properly is generally not a major undertaking. One of the most aggressive and expensive solutions is to install support piers under your home. Similar to what you might see above ground on a beach-front house, these piers are entirely underground and serve to help distribute the weight of your home evenly and onto more solid ground. The ground under your home is made up of layers of different types of earth, called horizons. The further down the horizons go, the more stable they become (generally). The piers drilled deep into the ground until the PSI required to drill them further is so great that even the weight of the home wouldn’t be able to create a significant amount of settlement. Watch the video below to see how it’s done.